Yesterday, I talked about the high quality of the food from Dream Dinners and our meal last night was a great example. We made the Chipotle Aztec Steaks and a side of Lemon Broccoli. In addition, I boiled some pasta, added a little butter and Parmesan seasoning, and we had a complete meal. I started by making the pasta and heated up the grilled pan. I cooked the steaks for 5 minutes on each side on medium high heat. Once I flipped the steaks, I added the broccoli to a skillet and cooked it about 5 minutes. I allowed the steaks to rest for a few minutes before we plated our meals. The steaks were cooked to perfection. I love using my grill pan and the directions on the steak were spot on. Our steaks were browned on the outside with pink inside. The flavor was great too with a little bit of a kick and a smoky taste. The pieces of broccoli were quite large and the lemon butter seasoning added great flavor. The broccoli was tender and juicy. 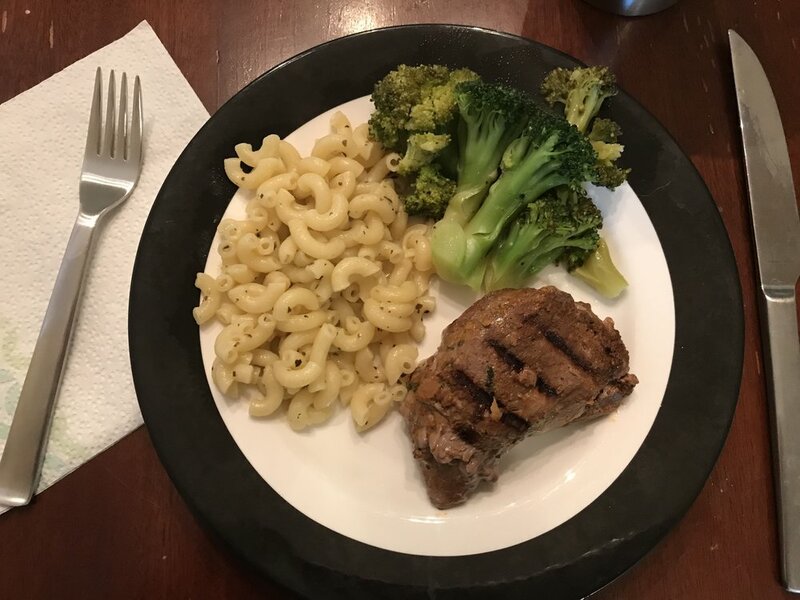 We were really satisfied with the steaks and this meal and can't wait to try our next Dream Dinners meal.